Sanzio is a bustling Italian restaurant situated in the heart of Willesden Green, a stones throw from the Willesden Green Tube Station. Created by Maria Sundrica, Sanzio offers authentic Italian dishes – uncomplicated, fresh and seasonal. Sanzio also offers a relaxing old-world atmosphere in which to relax with friends over a carafe of wine and a plate of antipasti, while waiting for plates of delicious Southern Italian fare. 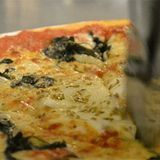 "Sanzio is a bustling Italian restaurant in the heart of Willesden Green, just around the corner from the Willesden Green Tube Station. Sanzio offers fresh and seasonal typical Italian dishes, with lots of antipasti, pasta, salads, pizzas, fish, meat and seafood. It also offers a relaxing old-world atmosphere in which to relax with friends over a carafe of wine and a plate of antipasti, while waiting for plates of delicious Southern Italian fare." What did you think of Sanzio?